Entry by Dove on Wed Aug 22 16:56:02 2012. I love the look on Fugaku's face! jajaj Kushina is the best! ah, what could've been... and what i'm sure is in some fanfiction somewhere. xD Kushina's like "YEAH!" 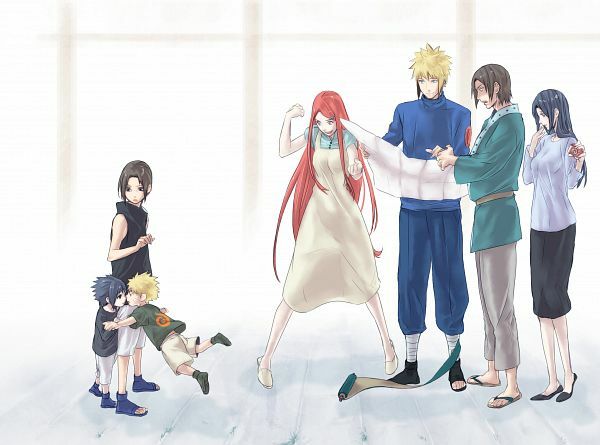 while Sasuke's dad is like " OMG....."
Rofl Kushina you Fangirl xD. Itachi's face Lololololol, U JELLY? What is this random scroll? @IT. : Fugaku was holding that scroll. XD;; He dropped it due to shock. Someone look really really closely at naruto's eyes k. he's like wtf. Love Fugaku vs. Minato reactions. i can just see itachi standing right there. And meanwhile Sasuke's being all shy and ukeish... Kawaii! It just like Naruto version of fanfic "American dreams in an English village" (Hetalia Fanfic). Innocent children, fujoshi mothers, shock fathers. I'm melting, that's just so sweet.